Just to keep you posted, today arrived in Guatemala the Shelter Box response team to evaluate the situation. Donations in kind, mainly medical supplies received from abroad, are being distributed in hospitals and humanitarian temporary shelters. 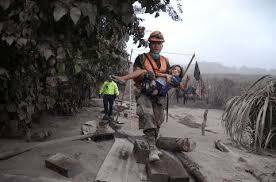 Solidarity of Guatemalans allowed the government to distribute enough water, food and clothes to the affected people. Most of the cash received in donations by the Rotary Clubs is being utilized for medicine and special equipment for burn treatment. The team spirit of Rotarians in Guatemala is awesome.